Power strip is an electronic device that makes it possible for people to charge multiple electronic device at the same time. Functions of a power strip especially stands out at home or at office where there are many charging demands while fewer sockets. Power strip, also called power board or power bar, is a device with a block of charging stations, AC outlets and USB ports sometimes. The strip is often connected with a flexible cable that has a mains pug in the end that can be plugged into the wall socket and long enough so that it can be used anywhere for many people, extremely convenient. Power strips are widely used both at home and office for audio, video, computer system, appliances, lights, business and other appliances. You can get more about power strips as follows. To choose a better power strip, you need to know its technical parameters. Materials used to make a high quality power strip is often excellent in fire resistance, insulativity, shock resistance and moisture resistance. Good materials can ensure a stable features of a power strip and keep color. The best material may be phosphor bronze that has good conductivity, elasticity and long life. In terms of appearance, different power strip may have different outlooks. Generally speaking, a nice power strip often has clean and smooth housing, and substantial frames. Besides, brand mark on the strip should be clear and complete without errors. Ordinary power strips are typical welded structures and optimization structure are core structure. There different rated power levels of power strips according to different charging demands and using situations, ranging from hundreds of watts to thousands of watts. Commonly the rated power of a power strip is 2500W or high power 4000W. According to provisions, the thicker a power cable is, the higher the power will be. For example, 2000W power strip matches with 1.5mm power cord and 0.75mm for 500W. Some power strips are designed with a master switch that can turn all electronic devices on and off at the same time. You can use this switch to control devices like lights, televisions, computers and other frequently used devices. Turning off electronics that you don’t need is a good way to save energy. Many power strips have an indicator lights to tell you the status of power, on or off. Some higher quality surge protectors have an additional lights that indicate the status of surge protection system to ensure a safer charging. Power cord or power cable is important. A power cable is needed for a power strip to plug into the wall sockets. A long cord can make it more convenient to let you charge devices anywhere you want. Power strips are functional with two energy saving functions and several features. • Reactive Compensation Function: a power strip is often built-in a reactive compensation circuit used for enhancing electricity power factor, adjusting network voltage, reducing line loss and improving power supply quality, in which way it can help save 10%~30% power energy, especially when you are using a refrigerator or a wash machine. •Timing/Delay function: strips are made of timing and delay components to save energy. Delay component can automatically turn off the power when appliances are in the status of standby. Timing component allow you to set time of energy supply and will turn off automatically when time is up. • has USB charging ports that can provide DC 5V current for any USB electronics. •built-in the world’s advanced zero power consumption system to ensure a stable performance. •adopt silver alloy contactor to ensure a reliable conductivity. •has a durable housing made of Fire-resistant PC materials and external heat-resistant Nylon. •the socket is made of thick Carobronze to ensure over 8000 times of plug in and out. A power strip or a surge protector is not only designed to meet charging requirements but also ensure a safe charging environment. There may be multiple protections in a power strip, including overload protection, short circuit protection, over or low voltage protection, heating protection and other protection systems. A surge protected power strip includes a surge processor that can detect the changes of current in the power flow and route the increased power to the grounded wires to avoid damages to your devices. 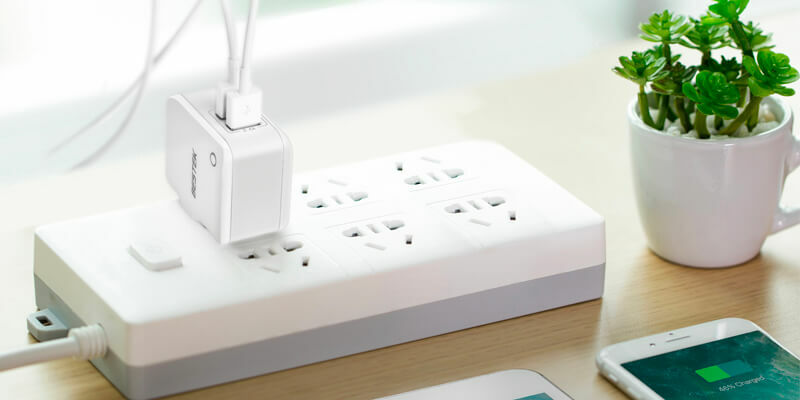 Based on components, there are smart power strips with USB ports and common power strips with only AC outlets. When build-in surge protection, a power strip is a surge protector. As for appearance, some power strips are a thin rectangular design that includes a row of sockets suitable for home use. Some are referred to as a double row strip with ten or more power sockets suitable for office. Power strip or surge protector is an essential electronic device widely used both for home and office use. When selecting a suitable power strip, you’d better to choose one with reliable quality and standard security systems. Different country may have different safety standards for appliances or equipment. How to Choose a Good Power Strip?